The Manhattan skyline during blackout of 1977. When the Los Angeles Kings and New York Rangers meet Wednesday for Game 1 of the Stanley Cup Final, it will be the first time since 1981 that teams with “Los Angeles” and “New York” in their names have vied for a major sports championship. That year, the Los Angeles Dodgers beat the New York Yankees in the World Series, avenging losses in 1977 and 1978. But it was for entirely different reasons that Los Angeles seemed ascendant in 1981. The 1970s had been a horrendous decade for New York, marked by a near-bankruptcy, a daylong blackout and a crime epidemic. New York City lost more than 10 percent of its population in the 1970s. Some of that loss was to its suburbs. But even accounting for New York’s entire metro area (which includes Long Island, northern New Jersey and parts of the Hudson Valley), its economy barely grew during the decade. I estimate, based on per-capita income and population figures from the Federal Reserve Bank of St. Louis, that the metro area earned an aggregate $523 billion in 1970. (All figures listed here are adjusted for inflation to 2013 dollars.) By 1980, the number was barely larger, $541 billion, representing an annual growth rate of just 0.3 percent. Metropolitan Los Angeles, by comparison — if not quite experiencing the prodigious growth that it did in the first couple of decades after World War II — saw its income grow by 2.6 percent per year during the 1970s. 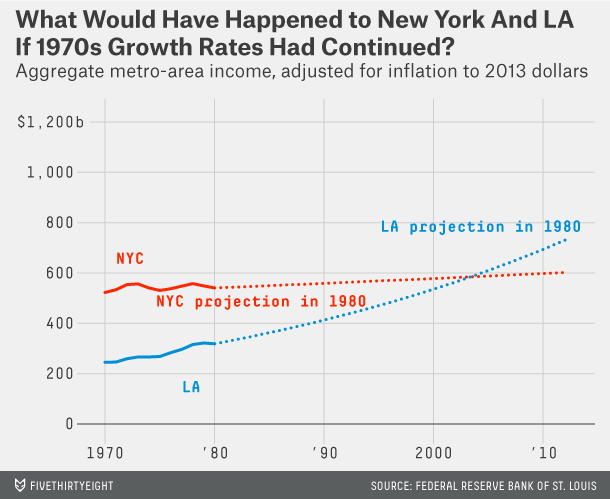 It turned out a lot differently: New York in 1981 was on the verge of remarkable rebound. The 1980s were a good decade for Los Angeles, which hosted a memorable (and unusually profitable) Olympic Games and saw its income grow by 3.4 percent per year. But New York, with a falling crime rate and a burgeoning financial sector, did even better, growing its income at 3.8 percent per year. The 1990s also saw reinvigorated growth for New York City itself, with its population passing 8 million for the first time by the end of the decade. Meanwhile, Los Angeles struggled with the Rodney King riots and a high crime rate, and unemployment in Los Angeles County peaked at nearly 11 percent in 1992. LA experienced an economic recovery during the second half of the 1990s, but it wasn’t enough to overtake New York. 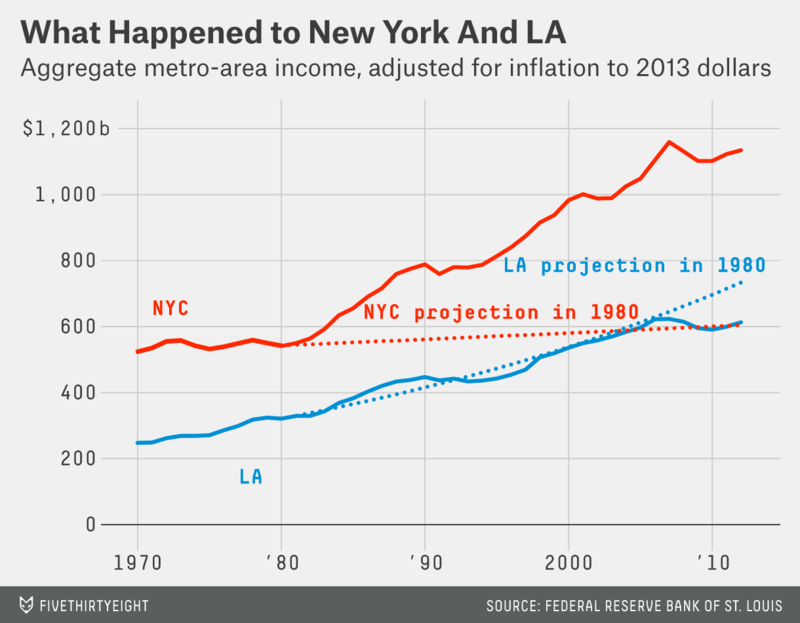 In 1980, New York and Los Angeles had nearly equal per-capita incomes. By 1999, per-capita income in the New York metro area was about $51,500 as compared with $42,500 for LA. The New York metro area, despite the Sept. 11 attacks and the financial crisis, also grew its income slightly faster than Los Angeles during the 2000s. As a result, instead of having lost its economic crown to Los Angeles, New York’s metro-area income is now 85 percent larger than Los Angeles’s — a wider margin than in 1977, when Reggie Jackson won World Series for the Yankees by hitting three home runs in Game 6. None of this is meant to slight Los Angeles. (I live in New York, but I can claim neutrality: My dad grew up in the San Fernando Valley. I still get a small thrill whenever I fly from JFK to LAX.) If the city has lost some of its Tinseltown shine, it now has some of the hallmarks of a mature metropolis: great food, great art, great architecture, quite a bit of history, improving public transit and so forth. As compared with a few decades ago, perhaps both New York and LA have more reason to feel secure about their place in the world — and less of the existential angst that can fuel sports rivalries.